J9s (Seversky Republic EP-1) from 3.div F8 in 1941. 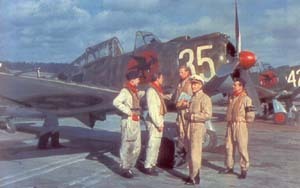 The pilots are from the left: Arne Frykholm, von Segebaden, Graf, Neppelberg and Weibull. Photo from F8 Kamratförening via Svensk Flyghistorisk Tidskrift nr.5/98. Arne Frykholm was born on 1 February 1917 as one of ten children in a missionary family in Madras, India. When he was a teenager, he was sent to Uppsala Högre Allmäna Läroverk in Uppsala, Sweden to study. He graduated from this school in 1935. He did his military service in the Air Force in 1936-1937 after which he went to the Cadet school in 1938. At this time he also his studies in medicine at the Uppsala University. He was promoted to fänrik (Pilot Officer) on 21 April 1939 at F8 (Wing No. 8). When he joined F19, he was part of the Reserve of the Swedish Air Force. At F19, he served as a fighter pilot. On 21 February 1941, twenty-six SBs and thirteen DB-3s from 5 OSAP attack Rovaniemi around 1200. They together dropped 14600 kg bombs. Enemy fighters shot down one SB and one DB-3, while air-gunners destroyed two enemy fighters. A four-plane group from F19 was in the air, but two had to return due to fuel shortage before any contact with the enemy formation. The two remaining Gladiators flown by fänriks (Pilot Officers) Arne Frykholm and Carl-Olof Steninger attacked however. They shared the shooting down of one DB-3 and one SB-2 south-east of Rovaniemi. The DB-3 (“11”, s/n 391695), which landed pretty much intact 18 km north-west of Vuotso, had dropped its bombs over Pajala on the Swedish side of the border! The pilot Lieutenant Aleksej N. Isatshev was captured, but the observer, Lieutenant F. Zaprjagajlev and air-gunner, Sergeant Major V. F. Volkov were killed. The DB-3 shot down by Frykholm and Carl-Olof Steninger on 21 February 1940. The plane landed almost undamaged and was later salvaged by the Finns. 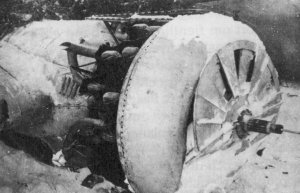 The damaged SB (s/n 5/95) from 3. Group was last seen leaving, trailing black smoke and didn’t return. The crew with pilot, Lieutenant Ivan D. Danilenko, observer, Lieutenant Aleksej A. Losev and air-gunner, Sergeant Major A. P. Petrov were reported missing in action. Soviet air-gunner claims two enemy fighters shot down but F19 doesn’t sustain any losses during this combat. Later in the war, he served with 3.div F8 at Barkarby, Stockholm. On 3 June 1941, Fänrik Frykholm suffered a ground loop with J 9 (Republic P-35A) no. 2155 (code 8-43). The incident resulted in damage to left landing gear leg, left wing, left stabilizer- and elevator. The repair costs were estimated to 28,000 SEK. The J 9 was very prone to ground loops. Frykholm ended the war with 2 shared biplane victories. After the war, he finished his studies to physician and between October 1946 to January 1949 he worked as a physician at the Swedish Church’s missionary hospital in Mnene, Southern Rhodesia. When he returned to Sweden, he worked at the Air Force as a specialflygläkare (special aviation physician). He studied at US Air Force School of Aviation Medicine, at Royal Canadian Air Force Institute of Aviation Medicine and at Royal Air Force Institute of Aviation Medicine at Farnborough. During this time he also continued to serve in the Air Force’s reserve at different Fighter Wings obtaining more than 5000 hours flying time. The last fighter he flew was the Mach 2+ Saab J35 Draken (Kite). From 1953, he also worked with aviation medicine at the Swedish Civilian Aviation Authority. In 1969 he left the Air Force and became Chief Aviation Medicine at ICAO’s headquarter in Montreal, Canada. He returned to Sweden in 1975 and became senior aviation physician at the Swedish Civilian Aviation Authority. He was also Vice President in the Aerospace Medical Association and International Academy of Aviation and Space Medicine. He published numerous works in his area of specialty. Arner Frykholm passed away on Lindingö on 4 June 2000. (a) Shared with Carl-Olof Steninger. SB-2 (c/n 5/95) from 3./5 OSAP crashed; Lieutenant I.D. Danilenko, Lieutenant A.A. Losev and Sergeant Major A.P. Petrov killed. (b) Shared with Carl-Olof Steninger. DB-3 (c/n 391695) from 5 OSAP force-landed; Lieutenant A.N. Isatshev POW, Lieutenant F. Zaprjagjev and Sergeant Major V.F. Volkov killed. Additional information kindly provided by Mikael Forslund.